Here’s how I see it, it’s easier to learn from the maths mistakes of others than from your own. Probably because there’s an emotional association with making a mistake, I find pupils jump at the chance to dissect and discuss the root of misconceptions of others, and by others I mean the Simpsons, rather than their own. In a class discussion, if you single out any of the pupils for making mistakes, you run the risk of embarrassing them and awakening the “I-was-never-any-good-at-maths” spectres that you’ve probably worked so hard to banish. But when Bart makes a mistake or Lisa can’t figure something out or Homer makes a booboo, then pupils are all over it. So I made a list one day of the ways in which my pupils were struggling with factors and it occurred to me that there were enough to make it worthwhile spending a whole lesson just dealing with the common misconceptions (“classic mistakes” I like to call them); and so it turned out to be. Not wanting to make pupils feel like I was pointing a finger at them, I brought in the Simpsons. Here’s a format I’ve tried a couple of times and it seems to work. What mistakes did they make? 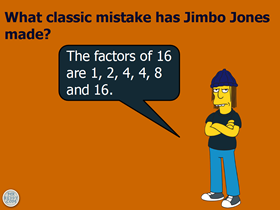 – Four Simpsons characters are displayed on the screen and in pupil workpacks, each of them making a mistake to do with listing or understanding factors. Pupils ‘think, pair, share’ the classic mistakes the characters are making and then write them down in their own words on the sheet. Card sort – Pairs of pupils sort cards according to which mistake is evident on the card. Some of the cards are correct (i.e. no mistake has been made). Then they share their results with the other pair on their table. A class discussion wraps this up. Make some classic mistakes for your friends to find! 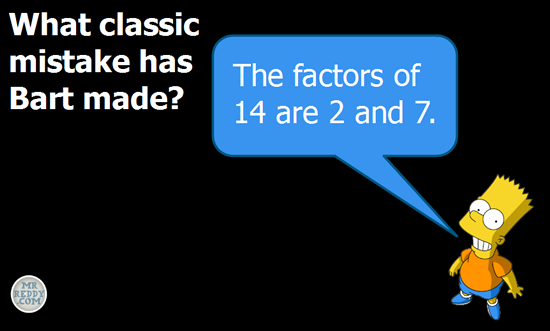 – Pupils must answer questions to do with finding factors and deliberately make classic mistakes on some of them. Their partner then has to check how they did. There’s a complete set of posters to download below. They contain images of the Simpsons making classic mistakes relating to finding factors, finding multiples and working with powers. Oh, one last thing…I don’t teach factors and multiples at the same time anymore. The words are too inter-related and trying to learn both at the same time means that they’re liable to get used incorrectly. I usually give a couple of weeks between them. Concept Cartoons – 3 characters comment on a particular maths problem with space for your comment. Classic Mistakes posters – Download posters for your classroom that provoke thinking around the classic mistake being displayed. These are super. Thanks for sharing them for me to steal. Love your posters and the idea of assigning classic mistakes to a character instead of singling out a student. Great idea!! Thanks Michelle. The same principle would work for the geometry stuff you’re about to teach. This is really nice. I very much like the idea of shifting the mistake to being someone else’s. Thanks Dave. Reducing mathsanxiety in year 7s gets me out of bed every day. Go for it (the stealing, that is). Love these! Just saved them all but I might have to actually sit down with the sort and figure it out. LOL! I see there are 4 pictures but then more types of cards than pictures. It’s late, I need to rest my eyes. LOL! Great – go for it! Please remember when doing the card sort that some of them don’t have a classic mistake on them. An idea I sometimes use is to give pupils a few blank cards for them to write their own classic mistakes on. Then they get another pair of pupils to sort them. Great stuff! Digging the idea of assigning blame to cartoon characters. I’m going to try that. Thanks Mr Carby – I hope they come in useful. Your Carby-isms are great. I’ll be adopting these, especially “Your shirt’s looking crazy right now. Tuck it in.” and “Stop acting brand new.” ! Thank you for these excellent ideas! It’s a great way to teach common mistakes and will definately make maths lessons more fun. Thanks so much for these! 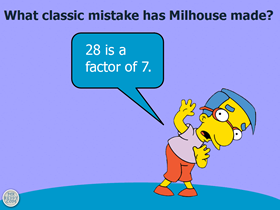 I’ve even mentioned them on my blog (you can see them up in my classroom) http://mrcollinsmaths.blogspot.co.uk/2012/10/misconceptions-mistakes-simpsons.html My students love them.